PGNExtract GUI is a utility to use pgn-extract easily (without using command line). - Do many different types of search on a pgn database using criteria as date, player, eco, material, position, etc. 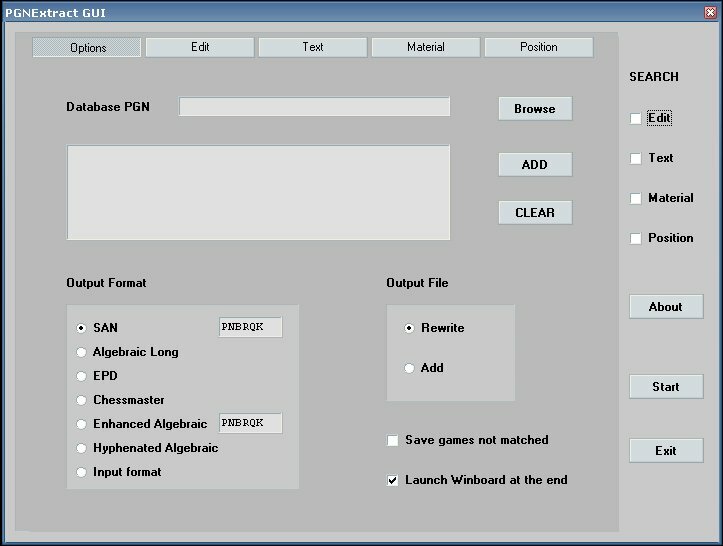 - Result.pgn is the file created with games matched. - Other.pgn is the file created with games not matched. - For big databases you must disable: "Launch Winboard at the end". - Karpov.pgn is a pgn example you may erase it. - eco.pgn is necessary to add eco and openings to pgn files in tags.